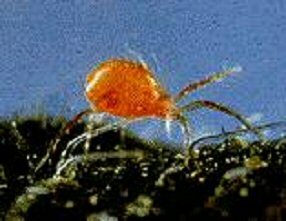 The Red spider mite - why red ? It’s a sort of light browny colour, although it does get a bit redder late in the season. Well one thing is for sure, it’s a right little breeder ! What to do - these little mites can really weaken your plants, and go on, and on , Oh and on ! Well, we turn to nature again - to a really red mite. These little mites, so the story goes, came from Chile to Germany with some Limes, then spread around a bit. To keep up with the Red Spider mites breeding it needs at least 21 degrees centigrade, which is easily obtained in the greenhouse. It will quite happily continue to chomp away outside though, all the way through the summer. 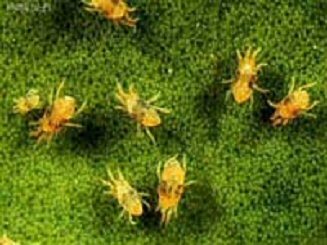 You should be able to get rid of the Spider Mite in the greenhouse with one application. A mixed ‘colony’ of about 2000 adults and youngsters and eggs will be supplied in a bottle. You just open the bottle, or carefully pop them on to the plants you want to protect, but we include full instructions.